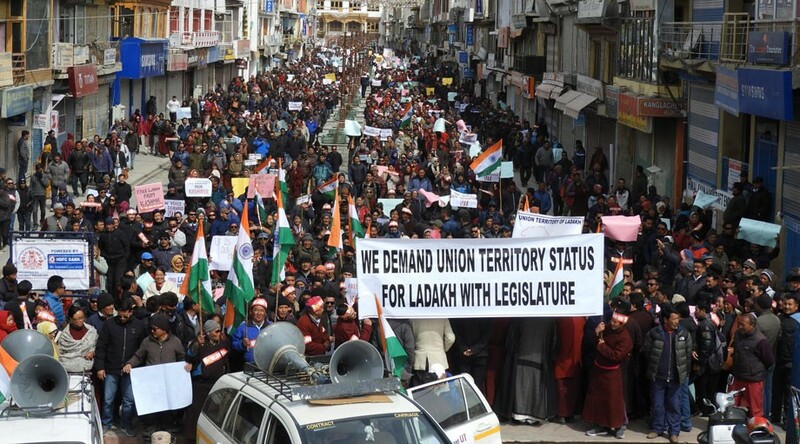 People from all walks of life participating in the rally demanding UT with Legislature for Ladakh at main market, Leh. Shouting the slogan ‘Free Ladakh from Kashmir’, thousands of people joined the peace rally demanding Union Territory status with legislature for Ladakh on March 13. The peace rally was called by Ladakh Buddhist Association supported by all the religious organisation and political parties. The entire business establishment remained closed for half day. PT Kunzang, Vice President LBA informed that the rally was scheduled in the month of February but because of unrest situation in the valley it got postponed. He said, "UT for Ladakh is a long pending demand and is asking for the status within the framework of the Indian constitution." Talking about the importance of UT status for Ladakh, Ashraf Ali Barcha, President, Anjuman Imamia said, “Ladakh has its own distinct identity, culture, and strategic importance because of which we are demanding the UT status. UT is not about benefiting one community but for the whole region”. He expressed the need of making people understand the importance, pros and cons of Union Territory status for Ladakh to avoid any doubts and rumours. “There are many people who are in doubts and against the UT status. It is very important that if anyone is against it there must be a reason after understanding it clearly. It shouldn’t be a decision based on misunderstanding and rumours”, he added. He further said that the demand for UT should not just be of political interest rather make people understand the pros and cons of the demand and let them decide whether they want it or not. Also, he stressed upon the need for unity, peace and brotherhood to carry out the demand effectively. Ven. Shedub Chamba, President, All Ladakh Gompa Association, Deachen Chamga, President, Christian community also expressed the need of UT status for Ladakh. Later, a copy of the memorandum was also submitted to the Governor of J&K.